Sand Bag Window | Defenshield, Inc.
See more without sacrificing safety. 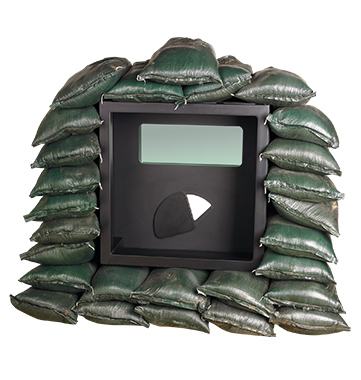 The Sand Bag Window (SBW) is designed to dramatically increase visibility at entry control points or patrol points where sand bag bunkers are used. The SBW allows soldiers to observe enemy movements through a transparent armor window and access a secure firing port without sacrificing protection. With the SBW, traditional sand bag fighting positions take on expanded uses from both a tactical and reconnaissance standpoint. The unit provides personnel with NIJ Level IV Armor-Piercing Resistant protection. Standard size is 34″ x 34″ and weighs 350 pounds. Custom-sized units are also available. The Sand Bag Window is constructed of a durable armor frame which supports the transparent ballistic armor view window. The entire assembly is powder-coated for durability and corrosion resistance. The cube-shaped unit ships fully assembled on one pallet. It can be implemented quickly within a sand bag wall using machinery or by four field soldiers. Alternatively, the SBW can be used in walled fortifications by fitting the base armor with anchor brackets. Viewports that have been damaged after absorbing fire or shock from explosives can be replaced in the field from inside the bunker. The process requires two people, no tools and can be completed in approximately ten minutes. Soldiers can change the glass without leaving the safety of the bunker. The SBW comes equipped with a closable weapon access port, providing soldiers with a secure firing point with minimal exposure. During combat situations, troops slide the port’s protective cover open to gain firing access and look through the window to identify targets. There is no need to leave the safety of the bunker or extend any parts of the body beyond the protected area to engage targets. The unit provides personnel with NIJ Level IV Armor-Piercing Resistant protection.